Water damage in a home can have many potential causes and finding the cause of your water damage can be tricky. Water doesn’t always behave in the way we expect; its properties allow it to do unexpected things such as travel upwards. If you suspect that a leaking roof might be the cause of your water damage, the best thing you can do is call a professional to inspect your roof for damage and potential leaks. If you are not sure as to the cause of your water damage, there are a few other things that you can check before calling your roofing professional. Air conditioners and HVAC systems have been known to leak and cause water damage. Depending on the location of your water damage, you may decide to have your air conditioning system inspected. Consider whether a plumbing problem may be the source of your leak, rather than the roof. If the leak only seems to occur when it rains, it is unlikely that your problem is plumbing-related. Condensation in your home from showers and appliances such as clothes dryers can cause water damage if your home does not have the proper ventilation to accommodate these appliances. If condensation may be a problem in your home, check to make sure that bathroom fans are working properly and that laundry ventilation systems have not become blocked. If your gutters become blocked with leaves and other debris, this can lead to water leaks in the walls or foundation of your home. It is a good idea to inspect your gutters regularly to make sure that they remain in working order. If you have ruled out other possibilities and have narrowed the problem down to your roof, you can go into your attic to try to identify the location of your roof leak. It is easiest to do this while it is raining. If you take a flashlight and shine it on the surfaces in the attic, you should be able to locate any water easily as it will reflect the light. If you are able, mark the location of the water with a permanent marker so that you can show your roofing professional later. You may not want to wait until the next rainstorm before having your roof repaired, so it is nice to be able to show your contractor exactly where the water appears to be coming into the attic. If you can’t find any water in the attic, or if you don’t have an attic, it is still possible that a leaking roof is causing your water damage. 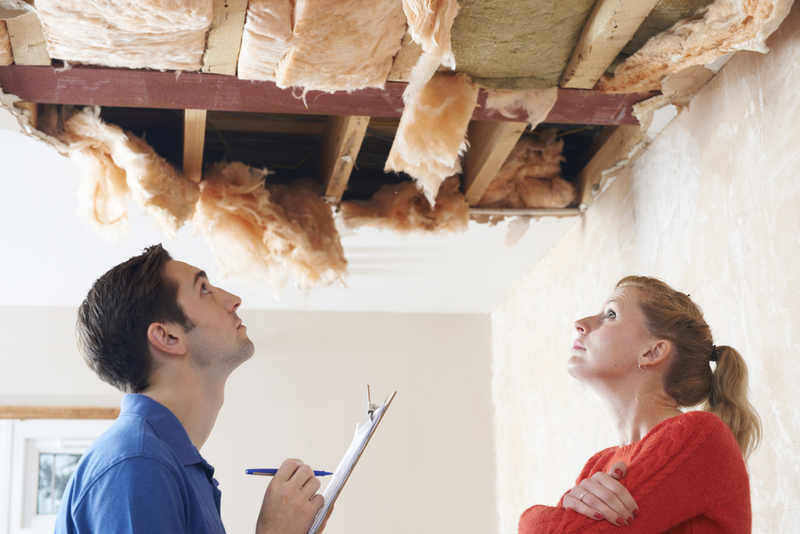 A professional will be able to assess your roof and locate any areas of concern.